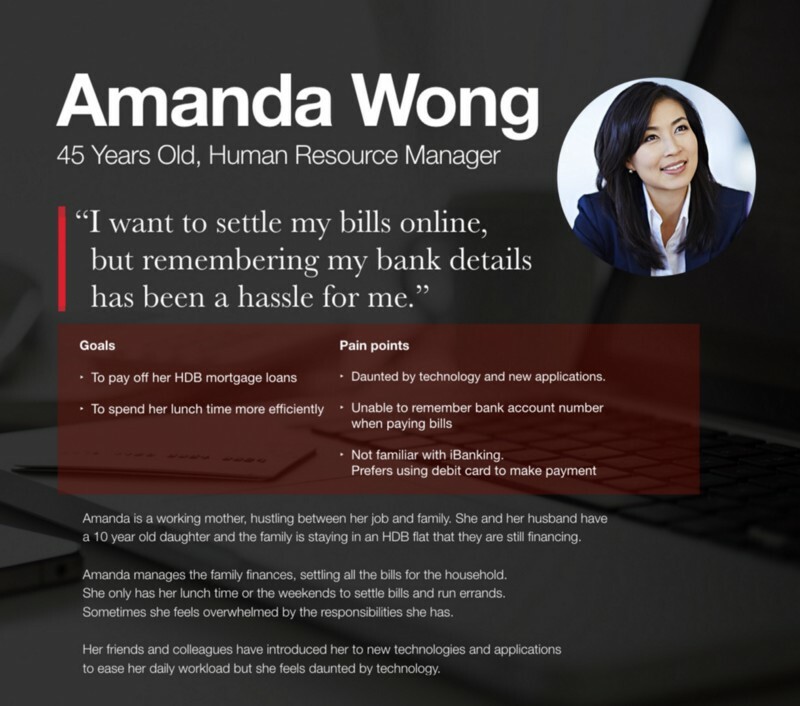 In our common quest for survival and stability in Singapore, we hustle between family and work. Managing our finances and remembering the due dates of our bills can be a chore. 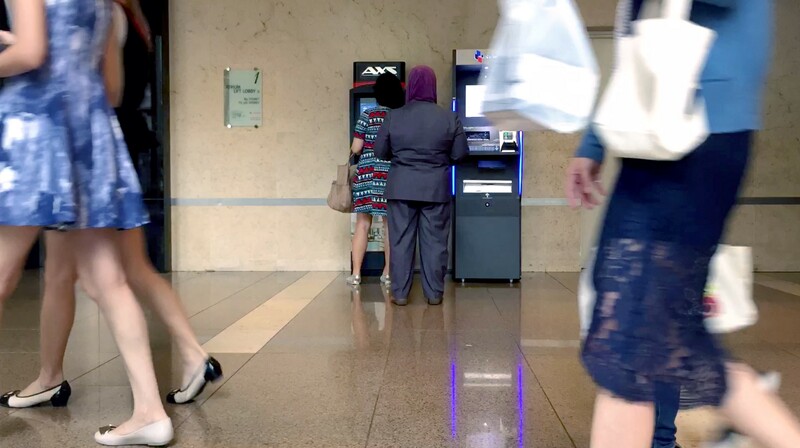 Singaporeans use the AXS kiosks located around the island to pay their bills and fines even though there’s an AXS mobile app (AXS m-station) available. On top of that, competition amongst service providers has been increasing— making a redesign essential. In a team of three, we sought to build an interface that streamlines the transactions to create a truly personalised experience for the user. To differentiate ourselves in an already mature and competitive market, we needed to define a desirable role for the app and how it would meet the needs of the targetted users. As a task-driven app, engaging in a feature parity war was neither strategic, nor had the best interests of the app’s users at heart. Discovering how we can make the process flow as smoothly as possible was the ultimate goal. Through a lean approach, emphasis was placed on gathering quick insights, rapid sketching, prototyping, user feedback and iterations. This helped establish a collaborative design effort within the team, valuing early customer validation over unknown end-user value. The discovery phase was a quick, high‐intensity effort that allowed us to audit the current app, review the competitor landscape, understand our user needs, behaviours and pain points. Sharing our thinking through rapid sketching created ample opportunities for everyone in the team to share ideas and provide input for the proposed solution. Prototypes were created and tested at various stages to validate to redesigned solution. There’s always gaps to fill to balance business goals and user needs. By finding ways to bridge this gap, it would shorten and further simplify the whole transaction process. To serve the users’ needs well, it is important to develop a good understanding of the competitions and industry. From our initial research, AXS do have many strengths against its competitors and it is not exactly an “unusable” app. But why is it abandoned? To further understand the needs of AXS users, we conducted contextual & guerrilla user research study on the user groups — which includes understanding behaviours related to use of the service. The objective is to uncover insights which could help craft value propositions of the service offering. Participants also provided feedback of their experience and interaction with the current AXS kiosk, AXS apps and SAM app. While we were at the AXS kiosk, we conducted interviews with the users to understand what are their thoughts on the service, and got them to demonstrate how they perform their tasks on the kiosk as well as the mobile app. 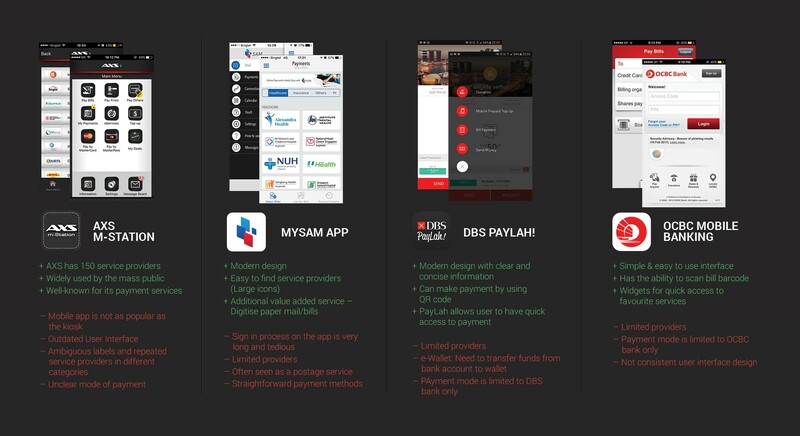 We also got them to perform the same task on our direct competitor’s app (MySAM app). 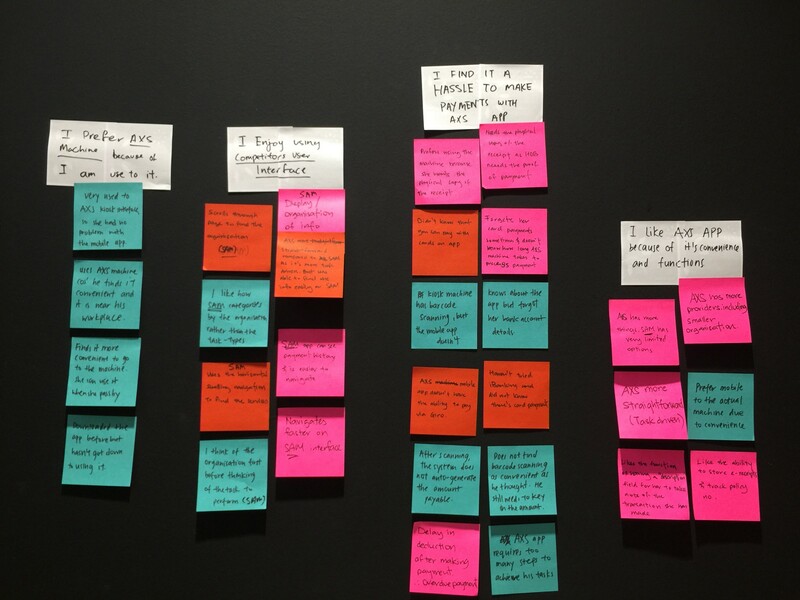 Through our user research, affinity mapping was conducted to draw out our key users’ pleasure points, pain points, contexts, and behaviours and we can slowly see patterns beginning to emerge as we synthesised our findings. With these key behaviours and pain points outlined in the affinity mapping exercise, we proceed to develop three key personas to model, summarise and communicate our research findings. We used personas constantly throughout the project to guide design decisions, priorities, and create empathy amongst the team. Our persona hypothesis consisted of three different archetypes which we used to facilitate discussions about our users needs, desires and varying contexts of use. 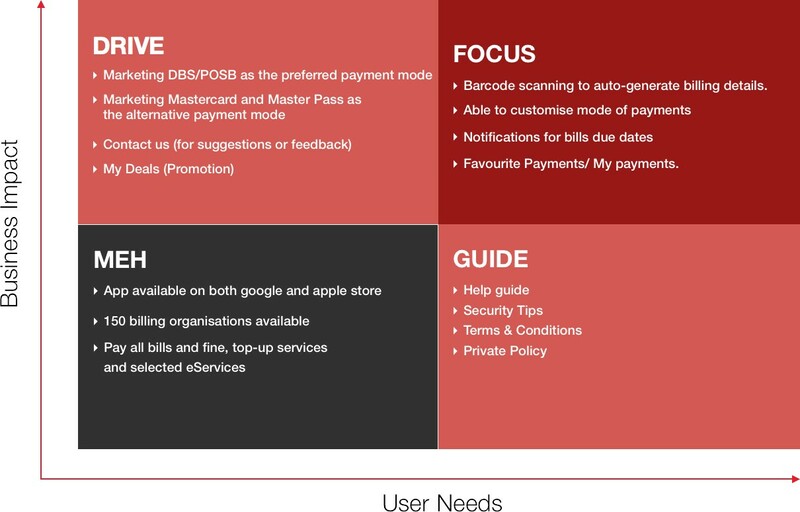 From there, we identified features and prioritised them based on user needs and business impact. Once we have finalised the key features that we want to focus on, we immediately got down to sketching out the wireframes of our new app. The great expectation of teamwork is that 3 heads is better than 1 — the combustion of ideas, healthy debates and perspectives enable us to constantly rethink and enhance our wireframes. We removed barriers to entry by simplifying the process and refining copywriting, making it easier for users to get started. We are constantly finding ways to make the whole process simpler and smoother in the future. 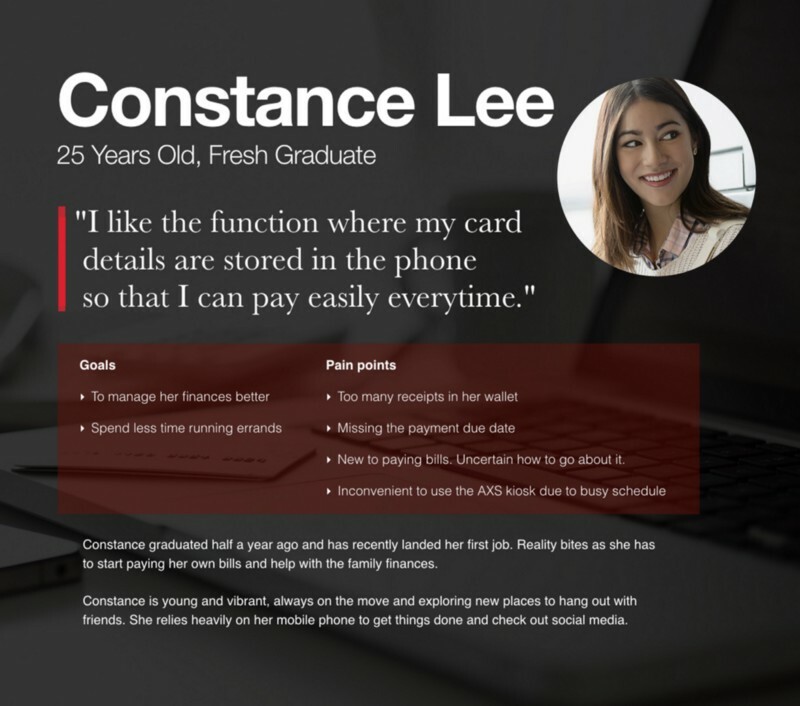 Payment methods is one of the key feature on the AXS m-Station that has been difficult to tackle due to it being a DBS subsidiary and their relationship with Mastercard. Getting the stakeholders into discussion on how we can help simplify the whole payment process would be the immediate next step. With the integration of mobile payment system into AXS m-Station, the whole payment can be greatly shortened. 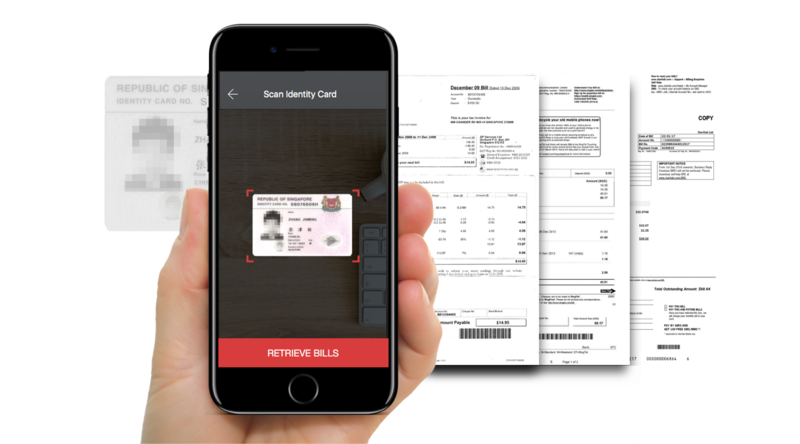 The possibility of allowing the scanning of ID or keying in ID number to retrieve bills tagged to the user. From this project, our team observed how different interview settings should be applied to different projects. 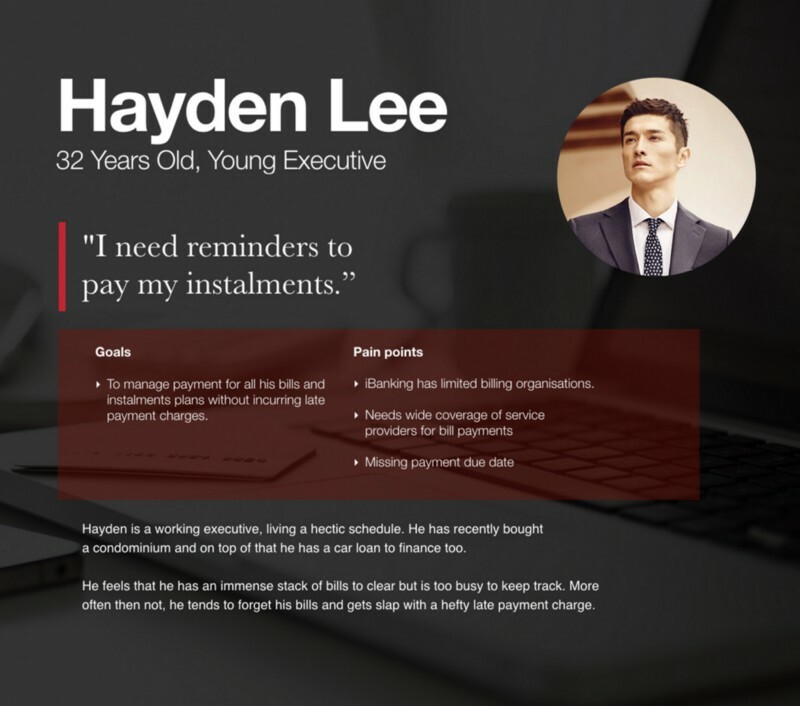 As this is just a task-driven application, contextual interview was a more viable option. Watching and listening as the user works in their natural environment, probing questions as the user navigates the task provides a more natural and observed data. Throughout the contextual inquiry, we observed how bias-ness for brand or habits can be mutated into a biased feedback. When asked for a feedback on the experience from using an application, many users provided answers that did not correspond to their actions, but was based more from their habits.